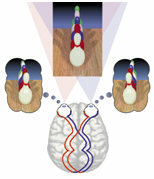 Visual-motor skills and endurance are developed through the use of specialized computer and optical devices, including therapeutic lenses, prisms, and filters. During the final stages of therapy, the patient's newly acquired visual skills are reinforced and made automatic through repetition and by integration with motor and cognitive skills. Vision Therapy as Treatment for Learning Disabilities. What is Seeing Double or Double Vision? Recent scientific research -- funded by the National Eye Institute and conducted at Mayo Clinic -- has proven that in-office Vision Therapy is the best treatment for Convergence Insufficiency. What is Convergence Insufficiency Disorder? What is Intermittent Exotropia caused by Convergence Insufficiency? Vision Therapy programs offer much higher cure rates for turned eyes and/or lazy eye when compared to eye surgery, glasses, and/or patching, without therapy. The earlier the patient receives Vision Therapy the better, however, our office successfully treats patients well past 21 years of age. Recent scientific research has disproven the long held belief that children with lazy eye, or amblyopia, cant be helped after age 7. Vision Therapy Eye Exercises as Treatment for Amblyopia (Lazy Eye), Strabismus (Crossed eyes), Convergence Insufficiency Disorder, etc.. Relief from Frequent or Chronic Headaches, Visual Stress, Eyestrain, and/or Stomachaches during or after Reading, School or Office Work. Visual Rehabilitation for Special Needs - Traumatic Brain Injury (TBI), Stroke, Birth Injury, Brain Damage, Head Injury, Whiplash, Cerebral Palsy, MS, etc. Vision can be compromised as a result of neurological disorders or trauma to the nervous system. Vision Therapy can effectively treat the visual consequences of brain trauma (including double vision). Brain Injury Rehabilitation - Success Stories with Vision Therapy. Article: Diagnosis of Non-Verbal Learning Disorder (NLD), Hidden Disability. Strong visual skills are critical to sports success. Not much happens in sports until your eyes instruct your hands and body as to what to do! We can measure and successfully improve eye-hand coordination, visual reaction time, peripheral vision, eye focusing, eye tracking and teaming, visualization skills, and more. Find out how children and adults improve coordination and sports ability through Vision Therapy. Vision Therapy can be the answer to many visual problems. Don't hesitate to contact our office with your questions. To read definitions of Vision Therapy by outside sources, see What is Vision Therapy? and/or Vision Therapy? Self-help Eye Exercises?. To browse through hundreds of stories writtten by parents, teachers, adults and children, go to a national of catalog of Vision Therapy Success Stories.